-2.6" * 2.6" * 1.1"
One of the best low cost non-Cmoy amps around. 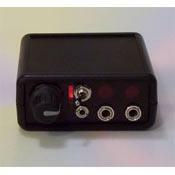 Very well made buy a real decent bloke who supports his products, this little pocket amp can only be faulted for occasional harshness at higher volumes and it's lack of soundstage. It amplifies all the flaws in the source too so don't expect it to hide any low quality file noise. Much better than it's price point and I paid far less than the suggested retail by scoring an under-bid eBay auction item. There is a variable gain switch on the inside too so it will drive low and high impedance headphones just don't expect this $50 amp to flatter your expensive headphones. Battery life is very good and the recharge circuitry alone make this well worth considering for any low cost headphone system. I've had two and regret having sold both. Electric Avenues is a small but ambitious company based in Toronto Canada. I know this review is going to sound like a commercial marketing ploy, but I am really just an enthusiastic customer who wants to share this product with everyone. For an interesting overview, visit their website...www.electricavenues.com. The PA2V2 is a redesign of the succesful PA1. This little baby was designed out of neccessity by an electrical engineering student. So, as you can imagine, it's been very well thought out. You can pick it up on their site for 60 bucks or on Ebay where they are regularily sold. Beware of Ebay however, I've seen a few auctions actually exceed the direct purchase value. The amp itself is compact and discreet, making it a great travel companion. I run an MPIO ML 300 through it. The combination is carried in a small camera bag which can hang on my belt or fit into my pocket. I typically wear a pair of AKG K240S which this amp drives with ease. The 240 has a very flat, natural sound and this unit brings out exceptional clarity and accuracy. At 55ohms, the typical portable cannot drive this set. The PA2V2 has enough power to bring these cans to deafening, dangerous levels while still maintaining an undistorted, balanced sound. I tested the limits of this amp by putting a pair of vintage Koss 4AA through it. 250 ohms and still no problem. In fact, the 4AA hadn't sounded so good. I was hearing a response that I wasn't even aware was possible. Super balanced right through the frequency range. I could go on and on extolling the virtues of this little baby. The AC adaptor is great for home use and will recharge a pair of AA batteries so long as its plugged in. I have found that its extending the battery life of my portable by almost double!! I use this with my vintage 2 channel rig and again, the sound is golden. Against the Headroom Total Bithead this amp is completely on par for a fraction of the cost. If you're looking for a great portable headphone amp, look no further. Check out their website and pick one up! !